By now, most business owners understand they need some sort of web presence to get noticed by today’s consumer. But many clients we come across are overwhelmed by the different options and have no idea where to begin with their online marketing. We’ve put together an 8-step guide to walk any business owner through some of the best actions they can take to get their business noticed online. Click the image below or follow this link to open and download a FREE PDF Guide. 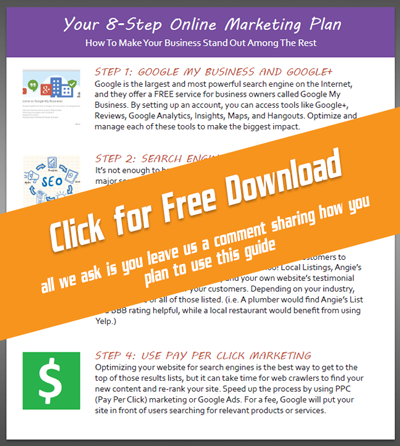 Google is the largest and most powerful search engine on the Internet, and they offer a FREE service for business owners called Google My Business. By setting up an account, you can access tools like Google+, Reviews, Google Analytics, Insights, Maps, and Hangouts. Optimize and manage each of these tools to make the biggest impact. It’s not enough to have a website. How does your website rank across major search engines for your targeted keywords? Conduct an analysis of your current rankings, and work on optimizing your site for search engine crawlers. When that’s complete, share links to your website online in forums or across social media. site in front of users searching for relevant products or services. time you have daily to set aside for these accounts, and determine which platforms you want to use. Learn the ins and outs of each, and share solid content as well as links to you site! keywords, tags, and content lends toward better search results and rankings. are free. Don’t spam users with links and offers – engage them in relevant discussion and become the go-to expert.